Great White Shark viewing from every angle! 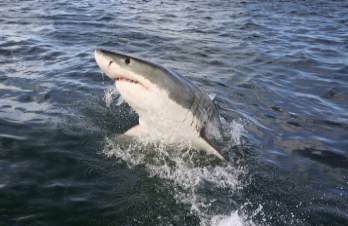 Mossel Bay shark diving is the ultimate experience in South Africa. The new shark diving boat “1st Strike” only takes 20 passengers on board, and a maximum of 5-6 people in the cage, so the experience here is much more personalized. The shark trips take place in one of Western Cape’s coastal towns called Mossel Bay, and offers the best conditions in South Africa to go shark cage diving with Great White sharks, with better weather, better sea conditions and most importantly, warmer water than the rest of Great White shark territory. Average weather boasts 320 Sunny days per year and the Guinness Book of Records reported Mossel Bay as having ‘the second mildest climate in the world”. Working around Seal Island (home to thousands of Cape Fur Seals), provides unique opportunities to observe “breaching” and attacks by Great White sharks on Seals… a spectacular sight and an excellent occasion to film and photograph this extraordinary event. The best chance you will have of seeing this take place is from June to September, which is our peak shark time in Mossel Bay with anywhere of up to 17 sharks seen on one trip and an average of 5-7 sharks per trip during our winter months. The bay also plays host to large numbers of Whales between June – Nov. The Whale numbers often match even those of the famous territory of Gansbaai. While on the subject of Marine mammals… schools of up to 500 Dolphins make a spectacular site and are often seen in the bay. All of this makes shark diving in Mossel Bay, a unique and very sought after experience. Join us on an shark diving trip in Mossel Bay. Mornings generally have the best conditions for the day with less wind out at sea. You can view them from the boat (surface viewing) or from inside of our indestructible shark cage. While most people choose to get in the water and see them at point blank range, at least 35% of our visitors choose to see them from the safety of a boat. Either way, a spectacular viewing is guaranteed! "Was looking forward to the experience, and I wasn't let down. My shark diving in Mossel Bay trip, was one of the best experiences of my life. Will definitely go again!" "The Shark Cage Diving was well worth the time, drive and money. Still get goose bumps every time I think of the cage dive. The Great Whites are incredible to see up close. Would do this again, great experience from both on the boat or in the water." The cage is made from galvanized steel to be 100% shark proof and is exceptionally strong, making it safe for viewing sharks up close. It has been professionally engineered and covered with a robust security mesh. The cage has plenty of room for all divers and has support bars for the hands and feet, providing you with firm grip and stability, so that you are and feel safe while taking underwater pictures of the sharks. There are no sharp edges making it very safe for not only you but our beloved Great White Sharks also. The cage is firmly attached to the boat and always stays on the surface of the ocean, which means that divers can get in and out of the cage when ever they want to. The top of the cage is safely covered and the cage is built to withstand all types of impact. Sharks do not attack the cage as they are not interested in attacking people. A misconception is that the cage gets lowered into the ocean. This is not at all the case. The shark cage is in fact attached to the boat at all times, and floats at least 60 centimetres above the water while the rest of the cage is submerged at about two meters deep, which means that when the shark comes to the cage, its you that goes deeper into the cage, and not the cage that goes deeper into the ocean.